Home » Marquis de Lafayette 1757-1834. 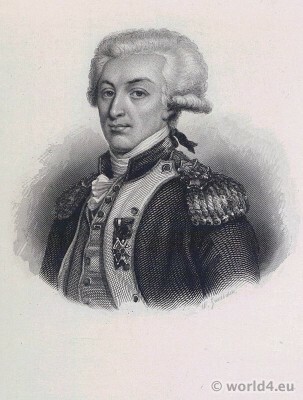 Marquis de Lafayette 1757-1834. Aristocrat and military officer. Marie-Joseph-Paul-Yves-Roch-Gilbert du Motier, Marquis de La Fayette or Lafayette was a French general and politician. He took part on the side of the colonists on the American Revolutionary War and played an important role in the French Revolution. La Fayette came from a noble family in Chavaniac. His father died in 1770 at the Battle of Minden (Seven Years War). After her mother’s death in 1770 he was already 13 years old orphan, but had in the following because of the large fortune of his family no material restrictions and was able to pursue his inclinations. After the declaration of independence of the British colonies La Fayette went with a self-recruited volunteer force in 1777 to America. There he fought for American independence and its affiliates with the Enlightenment ideals of equality, freedom and justice. When he returned to France, the people gave him a triumphant welcome and Louis XVI. received him into the Assembly of Notables. Even in the United States La Fayette was (written Lafayette) celebrated as a great war hero. Under La Fayette’s influence adopted Louis XVI. the Edict of 1787 (tolerance), which was especially good to the Huguenots. On 11 July 1789 he presented the Draft of the Declaration of Human Rights, which he had developed with the assistance of Thomas Jefferson. La Fayette was taken responsibility for ensuring that the king could try to escape on June 20, 1791. Three days after the second anniversary of the storming of the Bastille he had the open fire on an angry crowd. This massacre on the Champ de Mars with dozens dead cost him much of his popularity. La Fayette died on 20 May 1834 at the age of 76 years in Paris and was buried in the cemetery Cimetière de Picpus. His name is inscribed on the Arc de Triomphe in Paris in the third column. The Days of the Directoire. Costumes under the French French Revolution. This entry was posted in 1790, 18th Century, Directoire, France, Military, Nobility and tagged French military uniforms, Portrait on 10/22/14 by world4.